Translated from the original Bengali by leading Bengali devotee scholars; disciples of and under the direction of Srila Bhaktisiddhanta Sarasvati Thakura. Published by Sri Gaudiya Math Madras. This day Vrajanatha reached the Srivasangana rather a little early, when the devotees of Sri Godruma called at the Srivasangana just before evening in order to have a darsan of the evening service of aratrika (waving light and frankincense). Sri Premadas Paramahamsa Babaji, Vaishnavadasa, Advaitadasa, etc., took their seats in the arbor before the aratrika. Seeing the effusion of sentiment of these Vaishnavas of Sri Godruma, Vrajanatha thought within himself: "I shall have my object accomplished in association with them." Seeing his amiable face and devotional attitude they all blessed him. Within a short while, when they had left for Sri Godruma towards the south old Raghunatha Babaji Mahasaya noticed that tears were rolling down from Vrajanatha's eyes in an incessant flow. He had cherished a strange degree of affection and he asked him: "O darling, why are you shedding tears?" "O master, my mind has gone out of order as the result of your instructions and association; everything in our worldly life seems to be pith less and unsubstantial. I have grown impatient to seek protection at the Feet of Sri Gaura. Today a question has arisen in my mind, viz., who am I in reality and why have I come into this world?" "You have glorified me with this question of yours. When the truly auspicious day arrives for a jiva, it is this question that he puts first of all. There will linger no more doubt in your mind when you will listen to the fifth shloka of the Dasamula and its meaning. Just as sparks come out of a blazing fire, so also from Sri Hari, the chit-Sun, come out the innumerable jivas, atomic chits. Though they are not different from Sri Hari(in respect of their chit constitution), yet the jives are ever separate from Him. The eternal difference between God and the jives is this, that God is the Entity due to Whose special Virtue the maya -potency is His ever-controlled servitor, He being by nature her Lord: whereas he, who is by nature capable of coming under the maya prakriti, even when free, is the jiva." "The decision is excellent, no doubt. I am desirous of knowing its supporting authority from the Vedas; though the words of the Lord are as good as the Vedas, yet when they are substantiated by extracts from the Upanishads, people will be bound to admit them as conclusive." "Several Vedic statements corroborate this truth; I am citing only a few of them; just listen. We have in the Brihadaranyaka: Just as small sparks come out from fire, so do all jivas come out of God " and "This entity (jiva) has two places, viz., this (material) region and the other (chit) region; there is a third place border tatastha region forming the juncture of the two; staying at that place of the juncture, he sees both the regions, this one and the other one." Herein has been stated the border characteristic of the jiva-potency. This Br.up says again: "just as a big fish in a river at one time visits its Eastern bank, at another the Western one so also does the jiva move to both the sides, viz., that of dream (nescience) and the other of wakefulness (sentience)." "What is the meaning of 'tatastha' approved by the Vedanta philosophy?" "The line between the water of a river and the land on the bank is called the ' tata'. The land is contiguous to the water; where is then the 'tata'? The 'tata' is only like a thread discriminating the land from the water. The 'tata' is a very fine line of distinction which is not discernible with the gross eyes. If the chit world is compared to water and the mayika or material world to land, then the 'tata' is the fine line dividing the one from the other; the place of the jiva-potency is that line of juncture between the two worlds. Just as there are glowing atoms in the sun-rays, so also are the jivas; they may have a vision of the chit world on the one side and on the other this world as built by maya. The chit-potency of God is boundless, so is His maya-potency also enormous; between them are there the innumerable minute jivas. The jivas emanate from the tatastha shakti (border-potency) of Sri Krishna; so is the nature too tatastha (border-potency) of Sri Krishna." Of what sort is that 'tatastha' nature?" "In it vision can be had of both the sides from the midway position between the two worlds. The capability of coming under the control of both the potencies (chit and mayika) is the tatastha nature. The 'tata' (line of demarcation) can come into the river being dug out by the force of water; again when the land is hardened, the 'tata' becomes land. If a jiva turns his vision towards Sri Krishna, he becomes confirmed within Krishna-shakti (i.e., chit) but when he turns towards maya and turns away from Krishna (i.e. becomes apathetic towards Him), he falls into maya's snare to be fastened in it. This nature is 'tatastha'. "Has maya anything to do with the jiva's constitution?" "No, the jiva is constituted of chit material; being exceedingly atomic he is domitable by maya for want of the chit strength. In his constitution there is no trace of maya." "I heard from my professor that Chit Brahman being enveloped by maya has become the jiva; just as the unlimited sky becomes Ghakasa i.e., the sky of the pot when covered in it, so also the jiva that is Brahman by nature has become such being covered by maya. What does this mean?" "This is only mayavada. How can maya touch Brahman? If you say that Brahman has no potency, then how can there be His proximity to maya? When the potency of maya is non-existent? Brahman cannot undergo such a miserable condition under the cover of maya. If you keep the para shakti (essential potency) of Brahman awake, then how can maya, who is an insignificant potency, defeat the chit potency to create jiva out of Brahman? Brahman is infinite: how can He again be partitioned into portions as the great sky into skies in pots? maya's action on Brahman cannot be admitted. Maya has no authority over the creation of jivas; though the jiva is en atom, yet he is superior to maya. " "Some time before, a professor said that the jiva is the reflection of Brahman. Just as the sun is reflected on water, so is Brahman reflected on maya to become the jiva. What does this too, mean?" "This, too, is mayavada. Brahman has no limit; an unlimited thing cannot be reflected. The Vedas do not approve of the confinement of Brahman within bounds. The theory of reflection is very abominable." "On another occasion a world conqueror sannyasi said that the jiva is not a real entity; the conceit as jiva has arisen out of illusion; when illusion goes off, there remains only one undivided Brahman. What does this ,too, mean?" "This, to, is mayavada and is without foundation. According to the statement in the Sruti 'ekamev advitiyam what more can be had than Brahman? When them is nothing else than Brahman where from does the illusion come? And whose is this illusion? If you say that it of Brahman, then you make Brahman insignificant and keep Him not as Brahman. If a separate existence is admitted of the name of 'illusion', then the truth of 'advaya-jnana' is clashed with." "A scholarly Brahmana of this Navadvipa established that there is no jiva but only one Brahman who in his dream creates the weal and woe; when his dream is over, he is Brahman. What type of statement is this?" "This, too is mayavada. Transformation from the state of Brahman to that of jiva and the dream - how can all these be substantiated? Citing examples of the conception of silver in a pearl or that of a rope appearing as a snake the mayavadin cannot maintain advaya-jnana, these webs of tricks have been prepared for enchanting and fascinating the people." "It must be admitted that in the creation of the jiva soul maya has nothing to do; I do also understand that maya can exercise her power over the jiva." Now my question is whether the chit-potency has framed the jiva with the tatastha (border) natural?" "No, the chit-potency is Krishna's plenary potency; Whatever she produces is eternally accomplished; the jiva is not so eternally accomplished; when he becomes accomplished by practices (sadhana-siddha), he enjoys bliss like those eternally accomplished entities. The four kinds of confidantes of Sri Radha (to be described hereafter) are eternally accomplished; their bodies are about the same, with slight variations, with that of Sri Radhika who is essentially the chit-shakti. The jivas have grown out of the jiva-shakti of Sri Krishna. Chit-shakti is Sri Krishna's full (plenary) shakti, whereas the jiva-shakti is the incomplete shakti. From the plenary potency are produced complete entities, but from the incomplete potency have grown the jivas as atomic chit. Krishna manifests entities of different types in accordance with the kind of the shakti He applies. When established in His essential chit-shakti He reveals His essential Nature as Sri Krishna Himself on the one hand and on the other as Sri Narayana, the Lord of Vaikuntha. When he desired to have His adherent attendance ' nitya parshada' servitors in His Transcendental plane Goloka- Vrindavana Vaikuntha, etc. He through Baladeva created those Eternal Parshada as nitya-mukta jivas at those divine worlds. He reveals the three Forms of Vishnu, viz., Karanodakasayi, Kshirodakasayi and Garbhodakasayi. At Vraja He reveals His own Nature as Krishna with chit in fullness; as Baladeva, He reveals the eternally free associate jivas for the performance of the eight kinds of service of Himself as Sri Krishna. Again at Paravyoma (Vaikuntha) He, as Sankarshana, reveals the eternally free associate jivas for the performance of the eight kinds of service to Sri Narayana. Maha Vishnu, the incarnation of Sankarshana, establishing Himself in the heart of jiva-shakti as Paramatma, creates the jiva-souls of tatastha shakti. These jivas are susceptible to the influence of maya. Till by dint of God's Grace they get shelter under the hladini (bliss-giving) shakti they are liable to be overcome by maya. Innumerable jivas, overcome fastened by maya, are attached to the three gunas (sattva, rajah, tamah) of maya. As such, the conclusion is that it is the jiva-shakti that begets the jivas, and not the chit-shakti." "I have already heard that the chit-world is eternal and so are also jivas. How are, then, the growth, creation and revelation of eternal things possible? If they are revealed at some time and were unrevealed previously, how, then can their eternity be possible?" "The time and space as you feel in the material world are different from the time and space of the chit world. The time of the mundane world is divided into three periods, past, present and future; whereas the time in the chit-world is ever present as undivided. All the events relating to chit are conceived of as present. Whatever we describe is under the jurisdiction of material time and space; so while we say - ' the jivas were created', ' the jivas then were fastened by maya', 'the chit-world was revealed', 'there is no function of maya in the constitution of jivas, but that of chit,- then there is the influence of material time over our statement; the sort of description is inevitable in this fastened condition of ours. For this reason, in all our descriptions relating to jivas and chit, we cannot get rid of the influence of the mundane time,- the past, the present and the future come of themselves into them. While having a conception of the inner meaning of such descriptions, the truly discriminating judges conceive of the application of the ever present time. My darling, you should be very cautious while deliberating over these things and feel the presence of chit, having thrown off the unavoidable detestableness of words. All the Vaishnavas say that the jiva souls have been fastened by maya for the forgetfulness of their own nature, but they all know that though the jivas are eternal entities, they are of two kinds, viz. eternally fastened and eternally free. Such statements are due to the human intelligence being subject to errors and omissions. But a sedate person forms a conception of the transcendental truth by means of chit-samadhi. Our statements are material, whatever we speak about is interspersed with the dirt of words, but you will feel what the truth is. Argumentations have no footing here, for it is vain to apply them to inscrutable truths. I know that you will not be able to realize this truth in a moment. The more you culture about chit affairs the more will be evident the difference of chit from matter. Your body is material, all the functions of the body are material, but in reality, you are not matter, you are atomic chit (sentiment) entity. The more you know about yourself, the more will you feel your essential nature to be superior to the material world. You will not be benefited, if only, I tell you this or you hear it from me. The more you rouse up your chit character by means of the culture of Harinama, the better will you get a conception of the chit world. The speech and the mind, both have their origin relating to matter; they cannot touch the chit affairs by great exertions. The Sruti said: "From whom (Brahman) words recede back with the mind without getting Him." I advise you not to ask the decision about this of any one; feel it within yourself. I only give you the hint." "Krishna is self-effulgent like the blazing fire or the sun, within the range of the chit-Sun, everything is full chit concern; outside it, the rays radiate far and wide. A pencil is a molecule of the svarupa-shakti, and the rays within it are its atoms; and the jivas are such atoms. The svarupa-shakti displays the region within the orb of the Sun; the function of the region outside the orb is that of the jiva-shakti which is the atomic part of the chit-shakti. So only the jiva-shakti functions concerning the jivas. According to the Sruti, which says His (God's) para ( supreme) shakti is of different sorts, the para-shakti which is the chit-shakti, coming of its own regions as jiva-shakti is ever displaying the eternal jiva like the rays of the Sun in the border region between the chit region and the maya's region." "The blazing fire is material, the sun too, is material; the sparks, too are material. Why are these material things employed as examples in the case of chit-tattva (truth relating to chit)?" "I have already told you that whenever we have to speak about chit affairs with words that are material, the dirt of matter must be there; so it is under compulsion that such examples have got to be cited. As there is no other way, we have to explain chit things by using the words ' fire' ' sun ' etc. In reality, Krishna is quite different from and far superior to the sun; the region o' chit is surpassingly superior to the brilliant solar orb; the pencil of the sun and its minute rays are extremely inferior to Krishna's pencil and rays. Even so, those examples are used considering only the points of similarity, the examples show the points only partially and do not apply to all cases. The functions of the sun and the sun-rays are to reveal their own beauty and other things, and only these too indicate the self-revealing character and the character of revealing others with reference to the chit-tattva; but the power of ignition and the materiality of the sun are not applicable as examples to chit affairs. When we say that milk is like water, we mean only the liquidity of milk; otherwise can the milk, which has in it all the characteristics of water, be milk proper? Therefore examples explain only the character of a particular side of things, not that of all the sides." "How is it possible that the pencil of the chit-sun and the atomic rays there within, though not separate from the sun, are yet ever different?" "In the material world when one thing comes out of another, it either becomes totally severed from that, or remains adhered to that, as it is the property of matter. When an egg comes out of the mother-bird, it remains separate from her and no more keeps within her. The nails and hair on the body of a man though grown out of it keep together with him till they are clipped off. In chit affairs there is some specialty. In respect of whatever have come out from the chit sun, all are simultaneously both distinct from Him and also non-distinct. Just as the solar pencil and the rays coming out from the sun remain the same, so also the pencil from Krishna, viz., jiva-shakti and the atomic rays viz., the jivas, coming out from Krishna-sun, ever remain non-separate from Him; again even being non-separate, different jivas, getting different particles of independent volition, ever keep separate from Krishna. Therefore the truth of jivas being both non-distinct and distinct from Krishna is an eternally accomplished fact. This is the special feature of chit affairs. The savants cite only a partial example from matter. It is thus; there is a big lump of gold; a bangle is made of a bit out of it; the bangle is non-distinct from the lump of gold, in respect of its being gold but it is distinct from the lump of gold, in respect of its being the bangle and not the lump. This example does not apply in all respects; but it functions in a particular way; in respect of being both chit, the chit-sun and the chit jiva are non distinct, but in respect of their being respectively the Plenary chit and the atomic chit, there is distinction between them according to circumstances. The example of ghatakasa (sky scape in the pitcher) and mahakasa (fermamental sky) is quite inapplicable to the chit-tattva. "If chit (sentiment) object and mundane matter are generically different from each other, then how can either be the proper example of the other?" "Wherein lies the distinction between Supreme God and jiva souls?" "At first I shall explain the eternal non-distinction and show the eternal distinction thereafter. God is, in His Nature, Sentience, Enjoyer, Thinker, Self-manifest, Manifestor of others, Soul acting at pleasure. The jiva has got all these characteristics. Being the Possessor of Plenary Potency, God has these properties to the utmost extent; whereas the jiva being the possessor of only atomic potency, these properties are present in him to a minute extent. Though there is a distinction regarding the essential nature and character, regarding the possession of those properties yet there is a want of distinction between God and jiva. Being the possessor of His own potency to the fullest extent, God is the Master of Svarupa shakti (natural potency), jiva-shakti and maya-shakti; potency is His servitor under control, He is the Master of potency, His potency acts at His will - this is the essential Nature of God. Though the jiva has all the properties of God in minute jots, he is subject to maya. The word ' maya's used in the Dasamula (vice its fifth shloka)- in the beginning of this chapter) does not denote only jada (mundane) maya, here it means Svarupa-shakti. From its derivation, viz., by which measurement is made, maya is the name of that shakti which makes Krishna known in the chit world, jiva-world and mundane world, as such, maya here denotes Svarupa-shakti and not jada-shakti. Krishna is the Master of maya, whereas the jiva is under her control. So the Svetasvara Upanishad has said thus. "From all this diversity (which the Veda describes) the Master of maya creates the universe and the other (viz. jiva) is confined in it by maya. Know maya as His Prakriti (Nature) and the Master of maya is Supreme God. All this universe is pervaded by His shakti ". In this sentence of the Veda, the word. Mayee (Master of maya) denotes Krishna, the Controller of maya, Prakriti means plenary potency. These attributes as adored by all and the Nature are the special properties of God; they are not present in the jiva, even when liberated, he cannot get these attributes. The Brahma-Sutra says: "The free jiva souls are able to perform all things excepting the affairs of the universe,-viz., its creation, sustenance, restraint, etc." In it has been admitted that there is eternal distinction between God and the jiva. This eternal distinction is not imaginary, but eternally true, this distinction will not come to an end in any stage. On this account, just know it to be a fundamental statement that ' the jiva is the eternal servant to Krishna." "If the eternal bheda (distinction) is the accomplished fact, then how can the abheda (non-distinction) be admitted? Shall we then have to admit that there is a stage called nirvana (annihilation)?" "No, my darling, that is not the case, in no stage is the jiva non-different from (i.e., identical with) God." "Then why have you stated the doctrine of achintya-bheda-bheda inscrutable simultaneous distinction and non-distinction?" "With regard to chit-dharma (sentient character) there is eternal abheda between Krishna and the jiva, but in svarupa (essential nature) there is eternal bheda. In spite of the eternal abheda, the conception of the bheda is eternal. Though the abheda svarupa is an accomplished fact, yet there is not any indication there of relating to any state. Whenever there is an indication according to a particular stage, the manifestation of the eternal bheda is the stronger. For example, if a house is simultaneously said to be ' without Devadatta and with Devadatta,' then the eternal indication of its being with Devadatta, will ever continue, even though according to some consideration it may be without Devadatta'. I shall cite another example from the mundane world,- the sky is a mundane matter, even if there be a receptacle of the sky, too, in spite of that receptacle, as there is the indication of the sky alone, so the indication of the nitya (eternal) bheda that is there in the abheda entity, is the only indication of the thing." "Then, please, tell me a little more clearly about the eternal nature of the jiva." "The jiva is anu-chaitanya (atomic sentience), endowed with the attribute of jnana (consciousness), predicable by the term 'aham' (ego), enjoyer, thinker and comprehender. The jiva has his eternal nature; that nature is astral. Just as in the gross body, the hands, legs, eyes, nose, ears etc., being properly arranged, have manifested the crude nature; so the atomic sentient body, perfect in every feature, has manifested the atomic sentient nature; and that is the jiva's eternal nature. When he is fettered by maya, his natural body becomes covered with two phenomenal bodies, the one is called linga-sarira (subtle body), and the other the gross body. The subtle body is a disguise over the body of the atomic sentient nature; that subtle body is unavoidable from the time that the jiva is fettered to the time that he is emancipated. At the time of taking other births only the gross physical bodies undergo changes, but not the subtle body. The subtle body (of a bounder soul) is only one; at the time of changing a gross body, it takes away with it all the desires regarding karma made by it before accepting the subsequent body. The nature of a jiva who has got a new body is formed according to the instinct transmitted from the previous birth grown out of the desires thereof. And he gets his caste according to that nature. Karma or action ensues according to the varnashrama (caste and stage of life), and after death he again gets a similar course. The first cover for the eternal nature is the subtle body ( or mind) and the second cover is the gross (physical body)." "What is the difference between the nitya sarira (eternal body) and the linga-sarira ( subtle body)?" "The eternal body is of atomic chit (sentience), blemishless and really predicable by aham (ego). The subtle body is constituted of the three vitiations, viz. manah (mind), buddhi (intellect) and ahamkara ( egotism). "Are the mind, intellect and egotism of the mundane nature? If they are so termed how can their sentient functions be performed?" 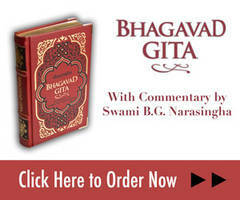 "Just look into the dictum of the Gita. "God with His chit-shakti (sentient potency) has two prakritis (shaktis). viz. para (superior) and apara (inferior); here the para-prakriti has been known as jiva-shakti and the apara-prakriti as jada (mundane material) or maya-shakti. The jiva-shakti is chitkana (atomic sentience) and, for this reason, it is called para or superior. maya shakti is jada and as such it is celled apara. The jiva is different from the inferior potency, which has in it eight coarse things viz., the five maha-bhutas (primary elements) and manah (mind) buddhi (intellect) and ahamkara (egotism). The last three are within jada prakriti and are therefore mundane matters; there is some appearance of jnana (sentience) in them; but it is not chit by nature, but of mundane matter. The mind places the affair of the knowledge of sensual objects on the images that it takes from mundane matter; this affair has its root in mundane matter and not in chit matter. The faculty that discriminates between good and bad relying on that knowledge is known as buddhi (intellect), that, too, has its root in mundane matter. And the egotism, too, arising out of the acceptance of that knowledge has mundane matter at its root and not the chit. These three, combined together, manifest a second nature of the jiva, related to mundane matter. The egotism of the subtle body of that nature of the jiva overcome with mundanity becomes strong enough to cover the egotism of the eternal nature. The egotism in the eternal nature connected with the chit-sun is eternal. In the stage of liberation, that egotism appears again. So long as the eternal body is almost hidden under the subtle body, the conceit of the connection with mundane matter remains strong, and consequently the conceit of connection with chit is almost extinct. The subtle body is too fine and therefore the gross body, covering it, makes it act. When the gross body covers the subtle body, then the egotism of the conceit of color and class of the gross body becomes the prevailing factor. Though the mind, intellect and egotism are of mundane nature, yet they have the conceit of knowledge, being the vitiated nature of the function of atma (soul). "Now I have understood that the eternal nature of the jiva is atomic chit and that in that nature there is elegance of the limbs made of atomic chit; when it is bound down (by maya), that elegance is covered by the subtle body; and then with the cover of the gross body, the nature of the jiva is subjected to much mundane vitiation. Now I beg to submit my question whether the jiva is entirely free from defects in the liberated state"
"Though the atomic chit is free from defect, it is imperfect, inasmuch as being extremely atomic, it is too weak. Under these circumstances, only this defect is seen in it, that the nature is capable of being almost extinct. The Srimad Bhagavatam has said, "O Lotus-eyed Lord, wisdom of one cannot be free from contamination without unalloyed devotion to Thee. Those treading the path of jnana or following the path of inductive process, devoid of an atom of devotion to They may think themselves liberated; on the contrary failing to adore Thy Lotus Feet, their minds ever remain impure although with great exertion and difficult efforts they might have attained a high stage nay. almost near liberation, but hurled down to the mundane plane because they have neglected to take recourse to Thy Divine Lotus Feet" As such, however ameliorated may a liberated jiva be the imperfection of his constitution will ever accompany him and this is the truth about jivas. It is for this reason that the Veda has said that "God is the Controller of maya, whereas the jiva is subject to the control of maya" being the tatastha shakti."